Online reviews are replacing testimonials as the go-to resource for consumers to research local businesses. Reviews provide great insight into what you can expect if you decide to do business with a local company. Whether you are looking for a place to eat, a new doctor, or a renovation company to help you with home repairs, online reviews provide your customers with valuable information. Your customers are reading your reviews online, and if you run a business, there is a great chance that consumers are writing reviews about your company, as well. In fact, according to a recent Local Consumer Review Survey, 85% of consumers say that they read online reviews for local businesses. What does this mean for your business? Reviews have a significant impact, not only on your business reputation, but they also play a large role in your ability to generate leads, attract new customers, and have a significant effect on your local SEO presence. As outlined in The Moz Blog article, Top 20 Local Search Ranking Factors: An Illustrated Guide, quantity of native Google Places reviews, and quantity of third-party traditional reviews are two of the top local search ranking factors. How reviews impact other facets of your strategy to acquire new customers online. Online reviews play a prominent role in the buying process. One of the first things a consumer does in the purchase process, whether they plan to buy online or in person, is to head to Google and explore their options. Reading reviews plays an important role in this process and can impact a consumer’s decision to visit your company website, explore your product/service options, and contact you. The results of the Local Consumer Review Survey conducted by BrightLocal shows that more consumers are not only reading reviews online, they are using them as a trust factor in their pre-purchase research before choosing a local business. The survey revealed that 79% of consumers trust online reviews as much as personal recommendations. It also revealed that 73% of consumers say positive customer reviews make them trust a business more, and only 12% of consumers said they do not use online reviews. Therefore, managing reviews has become an important brand management and marketing tool that your business can no longer afford to ignore, or it could negatively impact your ability to generate new leads and customers online. Do You Know Where Your Customers Are Writing Reviews About You Online? However, most review sites are industry specific, meaning that you will also need to identify the niche review sites that exist in your industry. As a general rule for eCommerce and local businesses, Google+ and Yelp should be your main focus; restaurants can benefit from Urbanspoon and Yelp; RateMDs is ideal for doctors and health care related websites; and home improvement companies & contractors can benefit from review sites such as HomeStars and Angies List. The important take away here is to identify the sites most used by your customers and become an active participant in those spaces. Having no reviews about your company is almost as bad as having a bad review. If you don’t have reviews posted online, it makes it more difficult for potential customers to decide to choose you over your competitors. In this sense, having no reviews can hurt your ability to convert a lead into a paying customer. The issue that most companies face is they don’t have a strategy for how to generate reviews online. If you don’t have them already, your first step is to set up your business listing on Google, other search engines, and applicable review sites. The best part is that it’s free to set up a profile on most review websites, and it’s a straightforward process. Speaking of reputation, let’s examine one of the most important review management topics – how to properly deal with negative reviews. Read the reviews that already exist: Your first step in the review management process is to read the online reviews that already exist. Knowing what your customers are saying about you is a good indicator of what you are doing well and where you need to improve. This will also provide you with a good indication of the review sites your customers use and where you need to focus your efforts. An effective way to manage online reviews is to set up a Google alert for your company name to receive updates when a new online review is posted. Ask: It may sound simple, but if you want your customers to provide a review, in most cases, all you have to do is ask. The best time to request a review is right after your customer makes a purchase. You can do this in a follow-up email, include the request on your receipt, and in all other communications with your customers. Also, don’t hesitate to ask them to write reviews on different websites. For example, you could request one client to write a review on Google + and other to write reviews on your Yelp page, creating a diverse mix of reviews on multiple review websites. Tell customers why you want their review: Explaining to your customers that you want their review to bring in new business and get feedback about their products and services is often enough justification to get customers to write a review. Customer appreciation eventsKeep in mind that having a few bad reviews is natural. You should have a good blend of positive, average, and negative reviews. Having only 5 star reviews could be a signal that your reviews are not authentic, and users may question this. Don’t worry too much about a few poor reviews as long as you have a majority of positive reviews. Under no circumstances should you write fake reviews about your business online. There are many well-documented cases of companies creating fake user accounts to write positive reviews. This is really more hassle than it’s worth, and the time you put into writing fake reviews could be spent developing a sound strategy to generate valuable reviews from real customers. and Google easily detects them 99% of the time. May be couple of months after creation but they will detect it. Writing fake reviews is not only unethical, it could have legal ramifications. In 2013, 19 companies in New York State were charged with violating state laws regarding false advertising, collectively costing them $350,000 (Huffington Post). Add to this the impact it had on their brand reputation, lost sales, and potentially negative impact on the company’s search ranking, and it’s clear this tactic should be avoided. While you may be tempted to give a negative reviewer a piece of your mind and dispute all their claims, you need to understand that a negative review here and there is normal. In fact, it’s a positive sign to your customers that you are being transparent, something that can work in your favor. Customers don’t expect to see 100% 5 star reviews. Most people understand that no matter how good you are at customer service, there is bound to be situations where you will get a negative review about your business. Respond immediately: Once you let cooler heads prevail and realize that one negative review is not the end of the world, it’s important to address the negative review promptly. Waiting to respond or not responding at all will make the customer feel as though you don’t value their business. Thank them for their feedback: Always thank your customers for their feedback, even if it is a negative review. Acknowledge their issues: Don’t avoid addressing the reason for the negative review. Apologize for the situation and offer up a solution to the problem. Be professional: Review your reply before publishing it. Make sure your spelling and grammar is correct, and everything you say complies with your company policies. Be positive and polite: Tone is very important. Remember, you are speaking on behalf of your business. Avoid being defensive. If the review brings to light a significant issue with your business or customer service, consider contacting the customer directly to resolve the issue. It’s not only about addressing the negative review, it’s about providing good service and repairing your relationship with your customers. A study conducted by the Harvard Business School – Reviews, Reputation, and Revenue: The Case of Yelp.com – revealed that each star on a company’s Yelp page can increase your revenue by up to 9 percent, pointing to the fact that online reviews do have a financial impact on your business. Google extracts reviews from Yelp and other online public properties not only to rank you but also to show your reviews from Google AND around the web. This means this impact will apply to your business success exponentially. 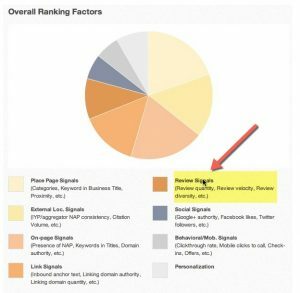 This re-affirms the point that review management is an important marketing strategy that needs to be integrated into your local SEO and lead generation plan as well as website architecture. Failure to address negative reviews or take advantage of positive reviews (use Google alerts or twitter monitoring tools to get an early notice), restricts your ability to generate leads, rank high and convert these leads into paying customers for your business. In today’s highly competitive market, consumers are unceremoniously scrutinizing your brand image and influencing your conversions through product rankings and other feedback mechanisms online. All the while, the majority of an organization’s net spend goes on online adverts and SEM (Search Engine Marketing). Is there a piece of the jigsaw we are missing? Are we allocating resources in the right direction? Google seems to think not. According to a recent study, they found that business listings that received at least 3+ star reviews took 41 out of 47 clicks. Accrediting only 6 clicks to 1 and 2-star reviews. Is it not time we use this intelligence to allocate resources accordingly? Website Builder’s latest infographic shows that customers are 12 times more likely to trust online reviews, rather than the actual descriptions companies provide. Couple this with the fact that 90% of the decision makers are reading less than 10 reviews before forming an opinion about the business, makes for pretty compelling news. According to the study, online reviews produce an 18% uplift in sales. Consumers are willing to pay 31% more for businesses with excellent reviews. 72% of consumers admit positive reviews allow them to place more trust in the business. Approximately 5-9% revenue growth is attributed to every star a business acquires. Unsurprisingly due to the fact that 84% of the customers admit they trust online reviews as much as a personal recommendation. The fact remains though; people are more likely to share negative experiences than positive ones. According to Dimensional Research, a whopping 95% of customers are more likely to share bad experiences, in stark contrast to only 87% sharing what they define as a good experience. You can lose 22% of potential customers because of one bad review. After three negative reviews that number jumps to 59%. Four or more negative reviews can push 70% of your potential customers away to your competitors. The most worrying statistic though details that on average, a single negative review can cost your business up to 30 customers. Disturbing news I hear you say, well that’s a given, but you have to find the most effective way to deal with the negative feedback. First of all, you need to know and understand the platforms whereby your customers are leaving these reviews. Each industry will have specific channels customers are most likely to use. Start investigating. Respond to all reviews, especially bad ones. Try to take the issue offline and your aim should be to turn the disgruntled customer into a less angry or satisfied one. The study indicated that a third of all dissatisfied customers either deleted their negative feedback or replaced them with good ones after a retailer replied to them. Regularly ask satisfied clients to review your business online. Think of different ways to award the positive review with a small gift or a discount. The findings clearly show that online reviews are pivotal to business success, and every business should allocate resources accordingly. To begin with, set up a review function on your site, micro- formatted for Google web crawlers. 63% of consumers search the web for business reviews, and you want them to go directly to your website for the reviews. Meanwhile, don’t underestimate the social media impact, as 55% of consumers are using Facebook to learn more about brands.